The Hollywood Revue once again does a nice monthly summary of the movies on TCM in October, so mark your calendars and set your DVR's. Get set for some classic horror films! 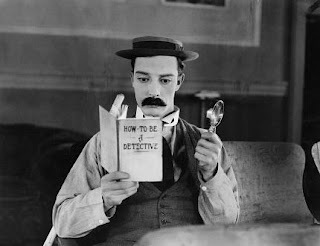 Every Sunday night will be all Buster Keaton, all night long. Not only that, since it’s October, it goes without saying that there will be plenty of classic horror movies to get you into the Halloween spirit. Monday nights are classic horror nights starting at 8:00 PM, with plenty more to come on October 29th , 30th, and 31st. TCM will also be commemorating the 100th birthday of director Nicholas Ray by playing a night of his movies every Tuesday night this month. I used to work for Sears in the old Crosstown building in Midtown Memphis. Although I never saw the pneumatic message tubes in action, you could still see them running down the walls in various parts of the building. 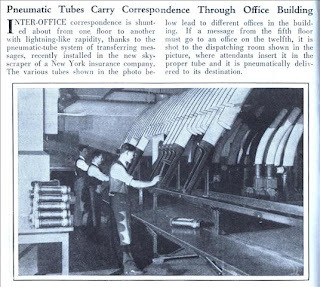 This July 1929 issue of Modern Mechanics, posted on Modern Mechanix, describes the operation of this newfangled communication device. Today's Sunrise Serenade was "Goody Goody" by Benny Goodman and His Orchestra. Click on the song title to listen courtesy of Jazz On Line. The playlist for the September 28, 2011 broadcast of the Swing Shift Shuffle has just been added to the playlist filing cabinet. Both of the Memphis Belles will be enshrined in a monument in Overton Park as a tribute to the famous plane and its namesake. As reported by The Commercial Appeal, Artist Andrea Lugar created a bronze statue of Margaret Polk, the "Memphis Belle" after whom her then fiance, bomber pilot Robert Morgan, named his B-17 Flying Fortress. A life-size version of Polk and an intricate relief sculpture of the airplane and crew members will be mounted in a limestone base and installed in a ceremony scheduled for Oct. 23. The weekly Red Hot Lindy Hop lesson and session continues this Friday night at the Rumba Room with a lesson by Becky and Matt and music by Becky. Free admission before 7:00 p.m., and $5 at the door afterwards. Next week's Lindy Hop features live music by the full New Memphis Hepcats big band. How To Be A Retronaut posted a nice set of recruitment posters from World War II. The group includes not only the armed services, but also support groups like the U.S. Cadet Nurse Corps, SPARS, and the U.S. Merchant Marine. During the period of the war when German U-Boats roamed the Atlantic at will, a career in the Merchant Marine could easily be as dangerous as combat. Today's Sunrise Serenade was "Louisville, K-Y" by Ella Fitzgerald. Click on the song title to listen courtesy of Jazz On Line. Time for another Betty Boop cartoon. In this 1931 short, Jack (a/k/a "Bimbo," although he does not look like the Bimbo from the other Boop toons) climbs the beanstalk and rescues Betty from the giant. She is still in her early form, including the dog-like ears. From the Internet Archive, here is Jack And The Beanstalk. In another colorful blast from the past, How To Be A Retronaut posted a series of color photographs of Paris during the German occupation in World War II. Before you get to thinking that it looks quite pleasant, bear in mind that the photographer worked for a Nazi propaganda magazine. This morning's Sunrise Serenade was "Apple Honey" by Woody Herman and His Orchestra. Click on the song title to listen courtesy of Jazz On Line. Looking for something to raise the standards of beverages at your next bash? Not sure how to mix a Bijou or a Black Velvet? Your troubles are over. Just refer to this 1933 edition of the The Savoy Cocktail Book from the Savoy Hotel in London. How To Be A Retronaut posted 80 pages of these luxurious libations, including some appropriate for "prohibition" countries. Today's Sunrise Serenade was "You Rascal, You" by Cab Calloway and His Orchestra. Click on the song title to listen courtesy of Jazz On Line. The playlist for the September 21, 2011 broadcast of the Swing Shift Shuffle has just been added to the playlist filing cabinet. It would not be surprising to see someone at the beach completely engrossed in their smartphone. Modern Mechanix posted this September 1948 issue of Popular Mechanics which demonstrates that someone had the same idea over 60 years ago. Here is a couple on a beautiful day at the beach watching a 3 inch TV screen. I do like the TV in the cab. How come that idea did not catch on? This morning's Sunrise Serenade was "All For The Love Of Lil" by Louis Jordan. Click on the song title to listen courtesy of Jazz On Line. The weekly Red Hot Lindy Hop lesson and session continues this Friday night at the Rumba Room with a lesson by Michael Q and Annabel and music by Michael Q. Free admission before 7:00 p.m., and $5 at the door afterwards. Today's Sunrise Serenade was "Fiddlin' Joe" by the Mills Brothers. Click on the song title for a sample from emusic, or click here for the album page. Like many, but not all, U.S. Presidents, Franklin D. Roosevelt could turn a nice phrase. How To Be A Retronaut posted a series of posters from World War II featuring quotes from FDR. This morning's Sunrise Serenade was "Old Man Harlem" by Hoagy Carmichael. Click on the song title for a sample from emusic, or click here for the album page. Our Saturday morning cartoon takes a literary turn this morning, as Cervantes meets Ub Iwerks in this 1934 animated short. From the Internet Archive, here is Don Quixote. 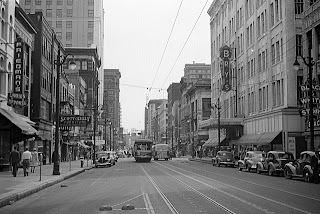 As a follow up to my antique Memphis postcards, I've started following Ask Vance, the blog of Memphis history and trivia expert Vance Lauderdale. (For those of you outside the area, the name is a pseudonym drawn from the intersection of two streets in Memphis). One of the first posts I noticed was about some undeveloped film a local couple found at an estate sale. 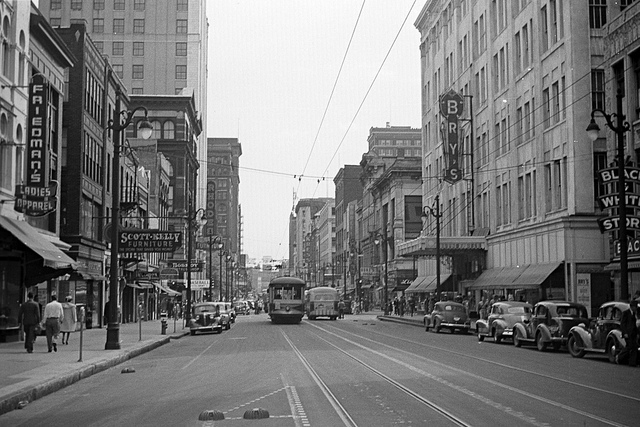 Developing revealed a collection of photographs of Memphis from the 1940's, which the finder posted here. Today's Sunrise Serenade was "Riverboat Shuffle" by Glen Gray and the Casa Loma Orchestra. Click on the song title to listen courtesy of Jazz On Line. This posting on Pappy's Golden Age Comic Blogzine features the type of story that could have only come out of the U.S. during World War II. A small kingdom in Europe is overrun by the Nazis, who shoot the royal family and most of the population. A loyal servant discovers the prince and king are still alive. The prince survives his wounds, and before the king dies, he tells his son about a giant, built by Nostradamus no less, with which the Boy King can save the kingdom. After crushing (literally) the Nazis, the Boy King has the Giant tow all of the remaining citizens to the "Promised Land," America. Yes, I know. It is a bit over the top. Remember, however, that in 1943, it was not exactly clear that the Allies would win the war, and comic books boosted morale. Sunrise Serenade: What Is This Thing Called Love? This morning's Sunrise Serenade was "What Is This Thing Called Love?" by Tommy Dorsey and His Orchestra. Click on the song title to listen courtesy of Jazz On Line. The playlist for the September 14, 2011 broadcast of the Swing Shift Shuffle has just been added to the playlist filing cabinet. The May 1931 issue of Modern Mechanics, posted on Modern Mechanix, included the following article about a German engineer and his radical new concepts for automobile design. This gent was ahead of his time. Listen to the questions he asked in 1931. WHY should the automobile you drive to work in the morning weigh a ton or more, be pushed along by cumbersome shafts and gearing, be powered with a heat engine which actually wastes more than half of the heat, or consumes more than twice the fuel it should, be equipped with four expensive tires and wheels when three would do, and require ten to fifteen feet of valuable curb space to park? Why should your car be slung on steel springs that are merely enlarged replicas of the old springs of horse and buggy days, and then force you to buy air or liquid or spring or elastic shock absorbers to correct their faults? Why should an engine be placed up in front with its shaft running lengthwise of the body and the power then carried back to the rear axle or forward to the front one and turned at right angles through power wasting bevel gears? Why not place the motor in line with the axle, its shaft in the same plane, and deliver the power direct to the wheels? Or, better still, why have an engine in the body of the car at all when you can have two smaller motors built right into the wheels, and eliminate all shafts, gears, and differential? Today's Sunrise Serenade was "Satchel Mouth Baby" by the Nat King Cole Quartet. Click on the song title to listen courtesy of Jazz On Line. The Red Hot Lindy Hop lesson and session continues this Friday night at the Rumba Room with a lesson by Becky and Matt and music by Becky. Free admission before 7:00 p.m., and $5 at the door afterwards. Today's Sunrise Serenade was "'A' You're Adorable" by Jimmy Dorsey and His Orchestra. Click on the song title for a sample from emusic, or click here for the album page. From How To Be A Retronaut, I learned that Stanley Kubrik was a photojournalist before he became a filmmaker. 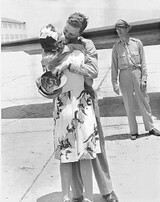 Look magazine sent him to Chicago in 1949, where he shot this series of images. This morning's Sunrise Serenade was "London Rhythm" by the Mills Brothers. Click on the song title to listen courtesy of Jazz On Line. To celebrate the birthday of composer Raymond Scott, today we feature a Warner Bros. cartoon that includes his most famous tune, "Powerhouse," during the conveyor belt scenes. From YouTube, here is the 1946 animated short starring Porky Pig and Daffy Duck: Baby Bottleneck. At right is the final image from my set of antique Memphis postcards that I have been featuring for the past few weeks. This single image card displays the Court Square Fountain and Columbian Mutual Tower (now more commonly known as the Lincoln American Tower). Both are alive and well in Downtown Memphis. Today's Sunrise Serenade was "Pell Mell" by Les Brown and His Orchestra. Click on the song title for a sample from emusic, or click here for the album page. 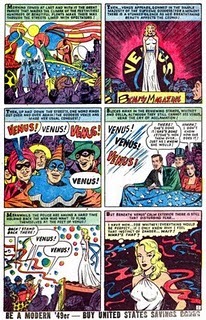 OK, I understand that the late 1940's was not exactly a time of progress in terms of women's rights, but this comic, Venus, posted on Pappy's Golden Age Comics Blogzine, is just downright bad. So bad, in fact, that I could not stop reading it until I reached the end. Our heroine, Venus, is the real deal - the Roman goddess of love. She came down to Earth from Mount Olympus to live among us mortals, and fell in love with the owner of a women's beauty magazine. (Seriously?) Being a goddess, she uses her powers to save humanity from danger. Her super power? She's hot. Seriously. No joke. She is such a babe, that men will do anything for her, and she uses that divine influence to save mankind. 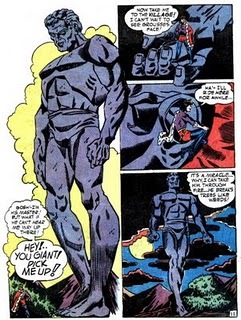 In this issue, the bad guy is the Norse god Loki. At least it was multicutural. This morning's Sunrise Serenade was "Call The Police" by Memphis' own Jimmie Lunceford and His Orchestra. Click on the song title to listen courtesy of Jazz On Line. The playlist for the September 7, 2011 broadcast of the Swing Shift Shuffle has just been added to the playlist filing cabinet. AUTOMOBILES for 1937 attain new levels of safety, comfort and flexibility. Some models are little changed in outward appearance but all boast internal improvements of interest to the motorist. Many refinements hitherto found only in machines of high price are available for the first time in makes of the lowest cost. 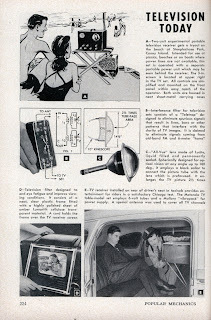 Cars featured just on the first two pages of the article include the sleek Studebaker coupe (top left), a Packard sedan (top right) and a supercharged Graham (lower left). One of the many improvements was increased cargo capacity, and these guys were not kidding around in that department. The 1937 Pontiac sedan (lower right) had sufficient trunk room for a steamer trunk, two sets of golf clubs, a spare tire and more. This morning's Sunrise Serenade was "A Porter's Love Song To A Chambermaid" by Mildred Bailey. Enjoy the video below from YouTube. The weekly Red Hot Lindy Hop lesson and session continues this Friday night at the Rumba Room with a lesson by Amanda and Mike T. and music by Amanda. Free admission before 7:00 p.m., and $5 at the door afterwards. Today's Sunrise Serenade was "There's A New Moon Over The Old Mill" by Artie Shaw and His Orchestra. Click on the song title to listen courtesy of Jazz On Line. Happy Labor Day from the Swing Shift Shuffle and the WEVL Music Factory Crew! 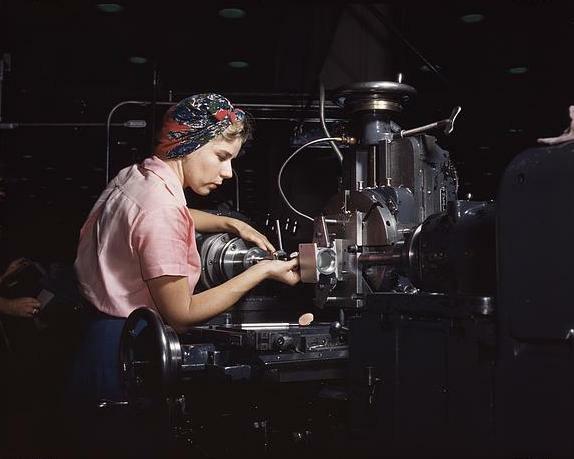 In the spirit of the day, here is a photo of a machinist at the Douglas Aircraft Company in Long Beach, California (1944) from the American Memory Collection of the Library of Congress. Since this is Labor Day weekend, I thought it appropriate to find a cartoon about somebody working for a living. In this fairy tale inspired 1934 short by Ub Iwerks, a tailor is working away in his shop, with the occasional break for some honey, when the king shows up for emergency trouser repairs. Some bees show up, spill the honey on the king's trousers, a giant becomes involved, etc. and the tailor saves the day. From the Internet Archive, here is The Valiant Tailor. Time for another installment in my series of antique Memphis postcards. The top card depicts the cobblestone area of the river front that was still used for loading cotton easily into the 1930's. In the bottom card, we once again see a view of the old federal building and courthouse, now the University of Memphis Law School. Unfortunately, the original Cossitt Library building next to it is no longer with us. Ich bin ein . . . Charlestoner? Many thanks to Vincent (aka movememan) who sent me his excellent video of a Charleston rave across the City of Berlin: I Charleston Berlin! Enjoy! This morning's Sunrise Serenade was "How High The Moon" by Ella Fitzgerald. Click on the song title to listen courtesy of Jazz On Line.